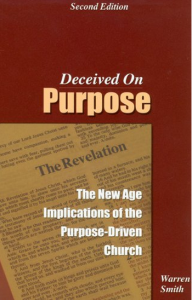 I have read numerous tracts, pamphlets, articles and books on Rick Warren and his Purpose Driven Phenomenon. I would recommend this book for fairly easy but informative reading (200 pages, fully footnoted in paper cover). Smith is a freelance writer with university degrees who works in social work on the west coast. Most interesting to this subject is his pre-salvation background in the New Age Movement. Coming from that perspective he saw similar wording in Warren’s books to the New Age vocabulary of his past. This led him to the Robert Schuller/Rick Warren connection which led him to all of Schuller’s contacts with New Age people in his books and programs. Smith runs Discernment Ministries (discernment-ministries.org) which has this book.